This is a review and six things I learnt reading it. Reinvent Yourself by James Altucher is his latest book on how to reinvent yourself in a world that is changing fast. I had an idea for a blog post in my head the last couple of days about reinvention. The basic premise of it was we shouldn’t reinvent ourselves but evolve ourselves. Reinvention to me sounds more like starting from scratch. To evolve is about growing yourself and building beyond what you currently are. The same day I stumbled across Altucher’s latest book, Reinvent Yourself, and I took it as a sign I should read it. Altucher is not your average 49 year old. He’s an entrepreneur, hedge fund manager, author of many books, and social media influencer. An open and transparent guy, he is candid about how he’s hit rock bottom more than once in his life. He’s suffered depression, failed in business many times, made and lost a lot of money and details past regrets about marriage and family. There’s no sugar coating in his online persona. Altucher thinks different to most people and it’s interesting to get inside the head of someone who has this type of mind. Reinvent Yourself (Amazon) is the follow up to his Choose Yourself, his bestseller book released in 2013. I own Choose Yourself but haven’t read it yet so can’t make a comparison in this review. Altucher takes a contrarian view on many things. Home ownership (don’t get a mortgage), debt (if you have it don’t pay it back), college (don’t go) and so on. He believes supply is almost infinite so demand has gone down. Altucher’s ethos is to avoid the corporate and institutional matrix. Relying on the government or educational institutions is bad because “they’re designed to make the rich richer and the poor poorer”. Don’t go to school and get in debt with the government. Or borrow money to buy a house. Don’t work for large corporations increasing supply of the talent pool. Having one source of income in his view means you are falling into the trap. It can be taken away from you at any time. Altucher’s definition of reinvention is defining your own freedom, improving relationships and forming good habits. Altucher believes we’re on the cusp of an “event horizon” where the current climate is an ‘us vs them’ one. He says it will rip apart everything that we know so to prepare for it you have to reinvent yourself. The book is full of nuggets of wisdom about all facets of life. Altucher has a lot of sage wisdom and common sense when it comes to the important things in life. He weaves in his own stories where he has gone above and beyond helping someone so he can persuade them to become a mentor to him. The importance of mentorship and finding good mentors. Finding good mentors is important to Altucher and he references it throughout the book. He recommends readers also find good mentors which, like any good thing, takes work. Research them to understand their background, read papers they’ve written, their history etc. Provide value to them. Altucher does this by sending ideas on how they can improve their business. Be available to them whenever they’re need you. Have a diversity of mentors as one will never teach you everything. He has virtual mentors where he just reads all their material (books, articles, blog posts etc) rather than seek direct mentoring from them. Learning from everyone you speak to. The book is full of anecdotes, like when photographer Chase Jarvis told him that taking a good photograph of someone is about connecting with them. Though not a good photographer himself he relates the skill of connection and influence as the means for survival and success in life. This ties in with his interview with Robert Cialdini, author of Influence: The Psychology of Persuasion. His interview with the former lead FBI hostage negotiator helped him develop negotiation skills in life. Like asking open-ended questions and getting people to say “no” as a starting point to any negotiation. For example starting a negotiation with, “Do you want this project to fail? will usually be met with a “no” allowing you both to find common ground. He talks about getting life lessons from Louis C.K’s comedy sketch. Why you should follow Picasso and prolific novel author Barbara Cartland on how their love of creating lead to success. Both of which were creative for the pure enjoyment of it and not for any financial reason. Picasso consistently reinvented his style of art and why you should always get out of your comfort zone when being creative. Think of the things you enjoy doing when you lose all sense of time. Find the things that bring you meaning. “Suffering will always be there but if there is meaning you’ll have less despair”. His breakdown of Eminem’s Lose Yourself and cognitive biases is nothing short of genius. How did he actually see that? Altucher loves a list, period. In the intro he describes when he’d hit rock bottom. His marriage was over, money was running low and nobody was giving him any opportunities. From that day on he started to change and on the page he includes a list of things that he planned to change. Everything from having the humility to being creative every day. I suspect this is the list he made on that very day. True to form, many of the chapters in Reinvent Yourself are in list form. This is just a sample of the list chapters. There are many more. Some – if not all – you can find on his blog, Altucher Confidential. One of the issues (if I can call it an issue) of the book is there is too many learnings in there. For those seeking a book that outlines a step-by-step process on how to reinvent yourself this is not for you. A lot of the information, while useful, is not about specifically about reinvention. This is an indirect connection but it’s a loose one and you could say it’s more about becoming a better person as opposed to reinventing yourself. Reinvention is not just about making bold changes. It’s about making small incremental changes each day. Making changes in yourself, habits, thoughts, diet, how you treat people all help. The list is endless. Learning from every experience and everyone you come into contact with is the best way to reinvent yourself. You may not have lots of money or access to high profile people like Wayne Dyer (RIP), Coolio and Tony Robbins like Altucher does. But every experience we go through and every person you meet has something you can at least take one thing from. Humility is key. Reinventing your mindset helps you see things differently. Altucher doesn’t think like most people. He shies away from material items, lives out of Airbnb and has a different perspective on how to live. He wasn’t always like this though and has been shaped by his life experiences. It’s an ongoing process. Reinventing yourself is different to how a pop star might. That’s about reinventing their image. David Bowie was particularly good at this. Personal reinvention requires deep introspective work. It takes constant persistence to reinvent yourself. You don’t wake up one day and suddenly change. It’s easy to slip back into old habits and thought patterns. Reinvention requires constant effort. Reinventing yourself requires other people. You need mentors to provide different perspectives and to get you thinking in different ways. 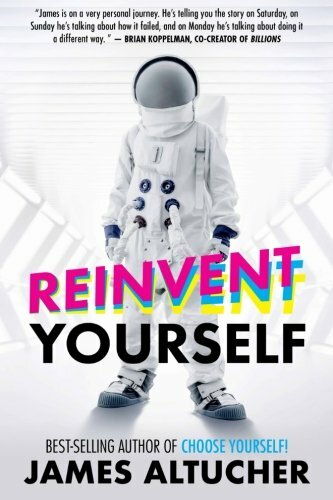 Do I recommend Reinvent Yourself? Yes I recommend you read Reinvent Yourself but I don’t recommend you read it purely as a way to reinvent yourself. If that makes sense? The book is more a guide to life. Or a guide to life as Altucher has discovered thus far. It shows you how to look at life differently and to always learn something from experiences and other people. If you’re looking for a step-by-step guide to turning you into a different person or how to change your image then this is not it. I imagine Altucher being a disorganised creative type with a messy desk. At times it feels like you’re reading from this desk as the book is often all over the place. That said, the book probably wouldn’t have contained so many useful pieces of information if structure was a priority. It’s packed full of entertaining and useful stories, anecdotes and observations. So packed you’ll likely have to read more than once to absorb it. Those are the best kind of books. If you’re looking to reinvent yourself over the long term or if you just want a general guide to life by someone who gives it a lot of thought then James Altucher’s Reinvent Yourself could be it.